Nauru is a small island located in the Pacific Ocean, firstly administered by Germany, until it became part of the British Empire, governed jointly by Britain, Australia, and New Zealand. The island of Nauru was a major source of phosphate, which caused its population to swell over what the tiny island could have achieved naturally. Independence was finally achieved in 1968, when it left its trusteeship under Britain, Australia, and New Zealand. Upon independence, it introduced its flag, of a blue field, divided by a gold stripe. The blue field represents the Pacific ocean, with the gold stripe representing the Equator line. Placed just under the line is a 12 point white star. The star represents the position of the island just south of the equator. The white represents the phosphate deposits, and the 12 points represent the original 12 tribes that made up the islands population back in history. 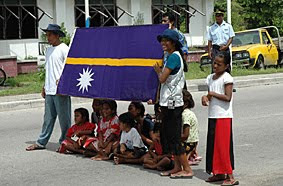 Nauru as a nation has enjoyed a chequered history. It achieved a lot of wealth from the phosphates on the island, but when the phosphates ran out, Nauru ran out of cash. In order to help the economy, they have been a tax-haven, a place for money laundering, a holding camp for asylum seekers to Australia, and been gifted money by various states for diplomatic recognition. It is one of the few states to recognise the Republic of China (Taiwan) and was, apparently, gifted over $50,000,000 from Russia for recognising the Georgian breakaway states of South Ossetia, and Abkhazia!